It’s Super Nintendo’s 25th anniversary and we want to introduce you to 9 of its strangest and most peculiar games. The popular Super Nintendo, known in Japan as Super Famicom and under the full name of Super Nintendo Entertainment System (SNES), has turned 25 years old this week. Nintendo’s 16-bit console meant a before and after in the gaming world, integrating more detailed graphics and higher quality sounds. 25 years later, it’s still precious to every video game fan—and of course also to those who came to enjoy it during the 90s. It was launched on November 21st, 1990 in Japan and one year later, on August 23rd in the United States. In Europe, however, the console wouldn’t be launched until June 6th, 1992 and it had to compete with Sega’s Megadrive. The Super Nintendo came with the classic Super Mario World, the best-selling game for this platform along with Street Fighter II, Donkey Kong Country and Super Mario Kart. But not all Super Nintendo games have been a total success, and many of them aren’t even known to many people. This is why, to commemorate Super Nintendo’s 25 years, we’ve compiled a list of its most peculiar and quite strange games that won’t leave you indifferent. This game, developed by Kaneko for the Super Nintendo was never launched, despite its announcement. A version for SEGA’s 16-bit console was also planned, but never launched, either. The release was planned for 1993, but it would be postponed one year to complete the game—and it never saw the light due to the sudden closing of the Kaneko branch in the USA. The curious thing about the game is the story and the political satire of the US’ presidential panorama at that time. Socks was the name of Bill Clinton’s cat, and the game is based on it. Its mission is to warn the White House that a missile has been stole, and to do that, it has to fight spies, politicians and journalists. That aside, at the end of each level, Socks has to fight bosses that look dangerously similar to former US presidents such as Richard Nixon, Gerarld Ford, Jimmy Carter or George H. W. Bush. And so the small presidential cat has to save the world from a terrorist nuclear attack by jumping, scratching and meowing. Pure American eccentricity. It’s one of the most searched and intriguing games. 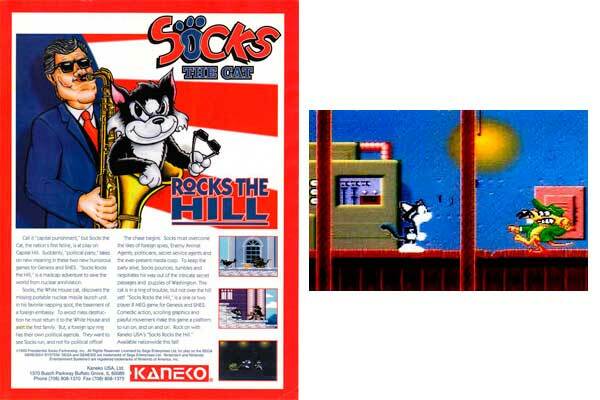 In fact, the rights for the game belonged to a Virginia-based, non-profit fanclub of Clinton’s cat, known as “Presidential Socks Partnership”. Kaneko then made a donation to charity to get the rights. The endearing cat was so popular in the US during that time, that it even got T-Shirts, mugs, stickers and of course, socks with it on them. This game is a drastic change to all classic superhero games. Developed by Sculptured Software and published by Raya Systems for the Super Nintendo, it was launched on November 1992. It’s quite an educational game, since it tries to raise awareness about diabetes—that’s where Captain Novolin gets his name from, since Novolin is an insulin brand. Captain Novolin has the task of saving Earth and Pineville city’s diabetic Major from alien invaders in the shape of fast food. Novolin has to avoid donuts and cookies and eat healthy food to maintain a stable glucose level, take his daily insulin shots and watch his diet. This game is part of a series of educational videogames by Raya Systems: Bronkie the Bronchiasaurus, Packie and Marlon, Rex Ronan: Experimental Surgeon. In this last one, surgeon Rex Ronan has to shrink himself to enter Jake’s body and heal him. Jake is a businessman who works in a Tobacco company and he is sick because he’s been smoking cigarettes since he was 15 years old. The surgeon also has to fight the robots the tobacco company has inserted in Jake’s body so that in case Jake survives and claims smoking is bad, the company doesn’t go broke. The best way to show kids that Tobacco companies are evil and that smoking kills. Developed by Almanic Corporation and published by Enix for the Super Nintendo, this videogame is a trip through the Theory of Evolution. First launched in Japan on December 21st, 1992, it would also be launched in the US in July 1993. The game starts out with Gaia, daughter of the sun and mythic embodiment of the Earth, who explains that you’re going to start a journey through several periods of time of planet Earth, in which you will undergo changes and evolve until you end up in the Garden of Eden with Gaia. It’s basically a very weird videogame that consists of travelling through the history of Evolution and the history of Planet Earth, combining Science, History, Mythology, Religion and Sci-Fi. You start out being a prehistoric fish and you can end up being a reptile, a mammal, or a bird, depending on your choices throughout the game. You have to fight for your food, get stronger and evolve, always moving forward, because only the strongest will survive. Yeah, Darwin as you’ve never seen it before. However, in this disturbing take on the creation of the Earth, there are mysterious crystals that affect evolution and turn the creatures that eat them into powerful monsters which dominate the rest. At the end of the game, after fighting a giant organism that grew from eating so many of those crystals, you find out that those crystals had been sent by a Martian civilization in hope of making Earthlings evolve faster. After their failure, however, they decide to leave Earth in peace and wait for them to evolve at their own pace and establish contact afterwards. And continuing with religion-themed games, in 1994 Christian publisher Wisdom Tree launched this game that, like its name says, is based on the story of Noah’s Ark. This biblical figure has to keep the animals in the Ark in check, who are growing restless and want to get out. To do that, Noah has to shoot them different fruits with a catapult to put them to sleep. That aside, at the end of each level he has to fight a boss—a very angry animal, being the first one Carl the Camel. Even though it has quite some bad graphics and isn’t exactly exciting, the curious thing about this game is the story of its creation. First we have to point out that it’s the only Super Nintendo game without an actual license, and that Nintendo never officially sanctioned it. At that time, Wisdom Tree was in a partnership with Color Dreams, the only company that had been able to legally elude the Super Nintendo’s lockout chip. That way, they made cartridges for this game that required an original Super Nintendo game to be connected to play. It wasn’t until 2014 that this game got an official console cartridge. But even more curious is the fact that this religion-themed game is based on the violent FPS Wolfenstein 3D, which consisted of killing nazis. In fact, the first license this videogame publisher got was to develop a game for the Nintendo Entertainment System (NES) based on the horror movie Hellraiser. However, this wouldn’t be possible because the console’s hardware was incompatible with the game’s color palette. On the other hand, the topic clashed with Wisdom Tree’s ideology, so they waited for their license to expire and then transferred the development to the Super Nintendo, redesigning the game with a religious theme. And that’s how the innocent Super Noah’s Ark 3D came to be. In December 1994, Scottish company DMA Design, now known as Rockstar North, creators of Grand Theft Auto, launched this unicycle racing game together with Nintendo in the US. It came to Europe on April 27th, 1995 under the name Unirally. With pre-rendered graphics and centered around speed, this game was launched to prove that the Super Nintendo was able to have games similar to SEGA’s Sonic. The response it got was very diverse: racing and rally games lovers missed the adrenaline and excitement, because the tracks were very simple and boring. However, skating games fans were very happy since they were given the chance to do pirouettes and stunts with a unicycle and the game centered a lot around that, too. Everyone agreed on that it was an original idea, because up to that point, there hadn’t been any games in which a unicycle came to life and jumped and drove around on its own. Or… well. That’s what everyone thought. But then Pixar filed a complaint over plagiarism against DMA Design, claiming they had stolen the idea and design of their character Red, a red unicycle which appears in Pixar’s Red’s Dream, a 1987 short—and is very similar to Uniracers’ unicycles. Trapped in a bicycle store, Red dreams of being part of a circus. Even though one of the developers protested—Mike Daily, who would later create Grand Theft Auto—, calling out Pixar for believing that they had the right over any computer-generated unicycle, DMA Design lost the case and Nintendo was forbidden to create more cartridges of that game. This game has several trivia facts. The first one is that it was the first Super Nintendo basketball game, published by Hudson Soft in 1991. During those years, Bill Laimbeer played in the NBA for the Detroit Pistons, a team known for their very aggressive and physical play style. Clearly, this game was inspired by that: It’s a basketball game set in the year 2030, and basketball has no rules anymore. The main character, Bill Laimbeer, is now the president of the NBA. A few years back, he had been expelled for being too violent, but now he is back, ready to take revenge. After expelling all the referees, a new kind of basketball game was established where fair play doesn’t exist and you can use weapons or anything else that comes into your mind to win. On top of that, he ordered the existing cloning laboratories to create an army of invincible basketball players. This way, he turned basketball into an extreme and violent sport, to the point where the players wear armour, detonate bombs or are armed with chainsaws. They no longer play to win points, but to win weapons. It’s an Aerial view videogame with two play modes: either versus the computer or another player, or the League Mode. In the latter one, you can create your own team and give each player a name and a different color. Each season has 14 matches, and starting out in the 3rd League, your goal is to reach the Super League. With bad graphics, music and sound effects, the feedback wasn’t exactly good, either. However, it managed to be on Game Informer’s ranking of weirdest celebrity videogames. There, they describe Bill Laimbeer as basketball’s Adolf Hitler. Continuing with basketball, during the 90s, Shaquille O’Neal was one of the NBA’s best and everything he touched turned into gold. That is, aside of the fighting game that carries his name and had him as main character. Published by Electronic Arts and developed by Delphine Software International, it was launched on October 28th 1994 for Super Nintendo, and Sega Mega Drive/Genesis. The weirdest thing about this game is that it’s seen as one of the worst videogames ever. For some reason, though, it was adapted in 1995 for Game Gear, Game Boy and Amiga. The story begins with Shaquille O’Neal walking the streets of Tokyo before going to play a charity game. Suddenly, he decides to enter a Kung Fu academy, where an old Martial Arts master awaits him. The man is convinced that Shaq is the chosen one to save a boy called Nezu from an evil mummy. He leads Shaq to the entrance to another dimension in which he’ll have to fight otherworldly monsters. Without doubt, seeing the famous basketball player doing karate didn’t leave anyone untouched. Expert and player reviews have given the game a place in the list of worst videogames. There is even a website dedicated to eliminate every single trace of this game, something called “The Liberation”. These people are also completely opposed to a sequel, which would be “an act of aggression” in their opinion. However, it doesn’t seem like their opinion matters a lot, because in 2014, Big Deez Productions announced that through crowdfunding, they had managed to develop a sequel: Shaq Fu: a Legend Reborn. Thankfully, the creators of the sequel are well aware of the disaster this 90s “abomination” caused and reassure the public that there are only two things the games have in common: the name and the main character. It looks like Electronic Arts has a talent of choosing the best current basketball player and make a disastrous videogame starring them. Unhappy with Kung Fu Shaquille O’ Neal, they decided Michael Jordan should shoot balls to kill monsters. Just one month after Shaq Fu, Ocean published the game for Super Nintendo on November 21st 1994 in the USA, arriving to Europe on March 11th, 1995. The US videogame magazine GamePro wrote a positive review, pointing out the diverse gameplay and its complex and intense levels. However, it called out the excessive Gatorade product placement, which the main character uses to recover energy. The Nintendo Power magazine, however, put the game into its top ten worst games because of its ridiculous story. The game takes place in Chicago (remember that Michael Jordan was the star of the Chicago Bulls at that time), where the main character is also going to play a charity game, but soon he notices his team has disappeared. It turns out they’ve been kidnapped by mad scientist Maximus Cranium, who demands the NBA star meet him in the Egyptian hall of a museum. Michael Jordan discovers an underground prison behind a secret door, and he embarks on a journey to find his teammates. He has several basketballs (boomerang ball, ice ball, fire ball, iron ball…) to defeat his enemies—amongst which we can find flying eyeballs, zombies, bats and even paparazzi. All in all, it’s a classic platform game, even though it’s more difficult, with more complicated controls and somewhat slower, but it has the corresponding power-ups and weapon variety. This videogame is inspired by US TV-show “Home Improvement”, starring Tim Allen”. Developed by Imagineering, Inc and published by Absolute Entertainment, it was launched on November 1994. The game has been described as a very loose adaptation of the TV-show. Nevertheless, the story still is about masculinity and what makes a man a man—AKA lots and lots of testosterone. During one of his DIY-programmes, Tim’s character announces that the tool company Binford is going to launch a new product series with his name. Just when he is going to go for said tools to show them the audience, he sees they have disappeared, and instead there is a note telling him to embark on an adventure to find them. And that’s just what Tim does; he starts going from TV-set to TV-set, looking for the lost tools. The first level takes place on a film set where a dinosaur movie is being shot, so he has to defeat these prehistoric monsters with his weapons, which are—surprise—tools. Thanks to a drill, a blow lamp and a chainsaw, he can engage his enemies. It’s a platform game divided into 4 worlds, in which we find Ancient Egypt with its pyramids and something that looks like a futuristic world full of robots. At the end of each level, he has to fight a boss to regain one of the stolen tools. Upon beating the game, we learn that the thieves were none other than Tim’s own children, who wanted to test their father’s masculinity. Because, what’s more masculine than beating monsters to death with a drill, in a kind of MacGyver-fashion? In fact, the most curious fact about the game is that it didn’t come with instructions for the controls. Instead, a screen saying “real men need no instructions” showed up. Written by Paula Gil Alonso.